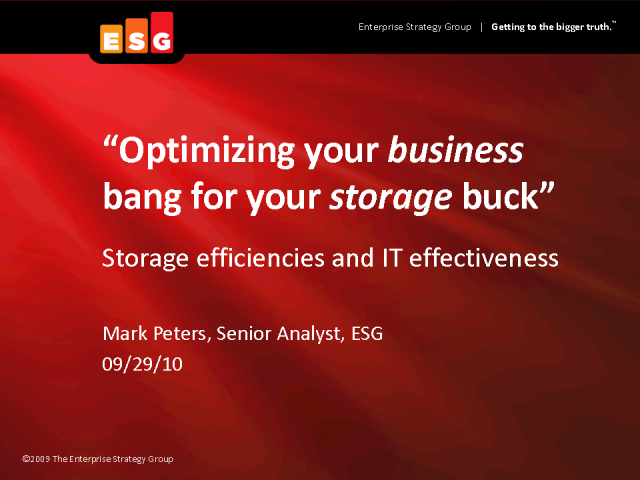 This session will look at how to improve and optimize storage economics from two perspectives. First, it will examine what is generally accepted as the standard view; what tools are available to ‘do’ storage more economically – such as storage virtualization, tiering, solid state usage and so on. Which of these are likeliest to produce the best results and are relatively painless? What does ESG’s research show to be users’ major challenges and priorities? Second, it will examine the ‘road less travelled’; what can imaginative and considered storage implementations actually mean to a business, and how can tangible results be measured? Real world examples will be used. All too often users can concentrate on the former (which we shall call ‘storage efficiencies’) and ignore the latter (which we shall call ‘IT effectiveness’). The truth is that both are important. The session will close with some simple and prescriptive recommendations to take this from merely conceptual to actually constructive.